PBR - The guerrilla is finally off Cliff Lee's shoulders. 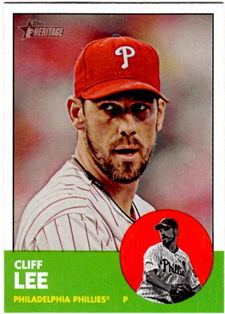 Thanks to an offensive eruption that included home runs from Chase Utley, Carlos Ruiz and Ty Wigginton, Cliff Lee recorded his first win of the season on Wednesday afternoon as the Phillies clubbed the Mets at Citi Field, 9-2. Lee tossed eight innings, allowing seven hits and two runs. He walked one and struck out nine. "It's been disappointing to me personally because I've let innings snowball and turn into a bigger problem than they should be," Lee told MLB.com. "It's been frustrating. It's been disappointing because we're in last place and we're a better team than that. Those two things for me are disappointing." Trailing 2-0, Chase Utley hit a two-run home run in the seventh and Carlos Ruiz followed with a solo shot, giving the Phillies a 3-2 advantage. The offense went on to score three runs in each of the final two innings to secure the victory. Jimmy Rollins snapped an 0-for-18 streak with a double in the eighth. Hunter Pence and Juan Pierre contributed two hits each in the victory. The two clubs will meet again Thursday night in the finale of the three-game series at Citi Field. Cole Hamels (10-4, 3.08) will oppose knuckleballer R.A. Dickey (12-1, 2.15).